YOUR MAMAS NOTES: Although this dish was surreptitiously whispered to Your Mama ten days or so ago at the Pacific Design Center in West Hollywood, CA, we are hardly the first property gossip to get on the Paula Abdul real estate train and discuss the Sherman Oaks, CA mock-Med mini-mansion the Emmy- and Grammy-winning singer/dancer/choreographer/reality television personality officially listed just yesterday with an asking price of $1,899,000. Miz Abdul started her long and circuitous slog up the slippery ladder of fame as a cheerleader for the the L.A. Lakers. She eventually became Emmy-winning choreographer and Grammy winning pop star who, after a long professional dry spell in the 1990s and early 2000s, emerged in 2002 as the sincere and compassionate but sometimes downright wacky acting judge on singing show juggernaut American Idol. She sat in that seat next to blunt-tongued Simon Cowell for 8 seasons before they both went on to the judges table on the first season of the American version of The X Factor. Miz Abdul, bless her heart, was unceremoniously axed from The X Factor after the first season. No doubt Miz Abdul was straight up mad as a cat in a crick but we suspect she'll be just fine. No stranger to staging a comeback she'll whip up a cheer leading-based exercise video or twinkle her toes on Dancing With The Stars and be right back in The Big Business of Show. Celebrity watchers and tabloid readers will recall that in late 2008 wannabe singer and disturbingly obsessed "fan" Paula Goodspeed was found d-e-a-d-dead of a drug overdose in her car parked on the street a few doors down from Miz Abdul's abode. No doubt that rattled Miz Abdul's cage. How could it not? Given all the tragedy that's taken place out front of the house, it's no miracle to Your Mama that Miz Abdul has finally decided she's gonna give the house up. We only wonder what took her so damn long to git to it. Anyhoo, perhaps in anticipation of her impending move, Miz Adbul had an estate sale at her home during which she sold her select pieces of furniture, fashions, footwear, a fancy antique clock or two, several gee-tars, tray after tray of sparkly (presumably costume) jewelry, various vases, and other objet and ephemera. 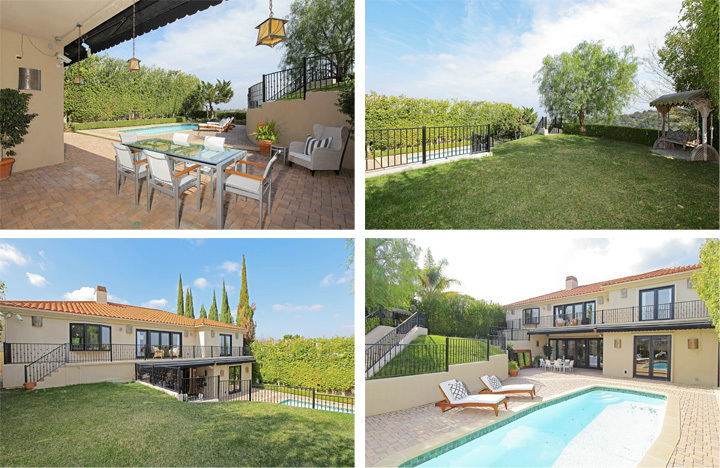 Current listing information shows the gated, two story abode, situated near the tail-end of a long, ridge line street above ur-suburban Sherman Oaks, measures a good-sized but far from grandiose 4,679 square feet and contains a total of 5 bedrooms and 4.5 bathrooms. Your Mama has it on good authority that Miz Abdul has vacated the premises and that nearly all (if not every bit) of the perfectly ordinary furniture and day-core seen in listing photos was placed there by Staging Lady in a Pink Toyota. 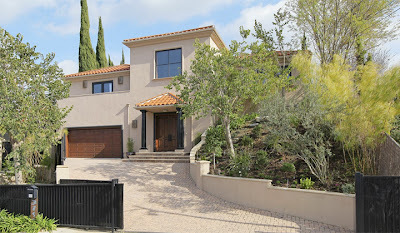 Of course the property and house have a serious, celebrity-style security system but as far as we can tell the surprisingly low metal gate at the street doesn't provide any real security or even an illusion of privacy for the front of Miz Abdul's mock-Med mini-manse which sits fully exposed well above street level. The electronic gate slides open at the push of a button or entry of a code to the aforementioned sloped driveway that bends up to a front-facing two-car garage and raised entry portico with red tile roof held up by a pair of slender black columns. Double front doors—wood doors, thankfully—open to an airy, eager-to-impress-the-guests-style foyer where twin staircases with elaborately scrolled wrought-iron banisters flank an arched doorway that Staging Lady in a Pink Toyota in turn flanked with a couple of curlicuing (and probably fake) miniature cypress trees, or whatever they are. Luscious looking mahogany-finished hardwood floors in the foyer—which may or may not be mahogany—extend through the wide archway opposite the front doors into the "formal" living room with over-sized fireplace, surprisingly low ceiling with glitzy black glass chandelier, and a contiguous series of wood-framed glass doors that connect the living room to a deep, covered dining terrace that overlooks the backyard swimming pool. A second archway stuck into a corner of the living room, this one adorned with black faux-columns no doubt meant to mimic the black columns at the front entrance, link to an open plan dining room/kitchen where a black glass chandelier identical to the one in the "formal" living room looms over a perfectly serviceable if very ordinary table likely selected by Staging Lady in a Pink Toyota or one of her minions. On one side of the dining table a wall full of wood-framed glass doors open to the backyard and swimming pool. On the other, a peninsula with rounded end separates the dining area from the country style kitchen outfitted with high-grade commercial-style stainless steel appliances, green-flecked granite counter tops, and honey-colored cabinetry. Upper cabinets have glass doors for displaying comestibles and cookware and lower cabinets have what appears to be a (most upsetting) series of crafty-looking, hand-painted tin panels set into each of the many doors and drawers. A bedroom and attached bathroom behind the kitchen provides direct access to the garage and could be used for any number of things that include a guest room for over nighters who don't rank high enough to sleep upstairs, a home office, hair and make-up room, Pilates or painting studio or, natch, live-in domestic staff quarters. The meant-to-impress but entirely unnecessary twin staircases in the foyer ascend to a second floor landing with inset display niches. One end of the landing opens to a large den/media room with vaulted and cross-beamed ceiling overhead, striped two-tone beige wall-to-wall carpeting like one might expect to find in a conference room a mid-priced business hotel underfoot, and some unpleasantly swagged brick red fabric hung over a wide wall of windows. Double doors at the top of the stairs, included, we imagine, to make a grand entrance, open to a long, rectangular master bedroom with more lustrous hardwood floors, a raised ceiling, fireplace, and row of wood-framed glass doors that open to a terrace with backyard, canyon, and San Fernando Valley views. The master bathroom looks impossibly out-dated with it's awful and so un-chic (but well-maintained) coral and beige tile color scheme. It is, however, sufficiently sized and appropriately equipped with double sinks, make-up vanity, over-sized soaking tub set into a bay window, separate steam shower with built-in tile bench for leg shaving and other things, and a separate windowed cubby for the evacuation and ablution apparatuses. Naturally, Miz Abdul's boo-dwar contains a celebrity-style walk in closet with built-in center island dresser/dressing table and floor-to-ceiling shoe racks for storing the ABCs of female celebrity footwear: Atwood, Blahnik and Choo. The second floor encompasses three additional secondary bedrooms and two more bathrooms. One of the three guest/family bedrooms has lovely canyon views through wood-framed glass doors that open to the terrace that runs the full width of the second floor at the back of the house and at least one of the other bedrooms opens to a narrow balcony with tree top view over the driveway. Lower level living areas spill out to a covered dining and entertainment terrace that surrounds a fairly (and oddly) narrow swimming pool nestled into a visual gully between a tall row of hedges along one side and and a curving concrete wall that holds back a slope that flattens out to a tree-shaded grassy pad with canyon view. The canopied Tibetan prayer house meets swinging park bench thingermabab set into the trees on the backyard's upper level is probably a perfectly shady place to whittle away a summertime cocktail or two but otherwise we find it an unspeakable mistake. We're not quite sure to where Miz Abdul has decamped but, as mentioned earlier, we have it on good authority that she's done decamped for greener real estate pastures, whatever and where ever they may be. Miz Abdul's immediate neck of Sherman Oaks isn't known for its big name residents but there are a couple notable neighborhood denizens who include (as the crow flies) Tinseltown's big daddy of celebrity gossip Ted Casablanca and Emmy-winning former child actor (and recently out of the closet lesbian) Kristy McNichol, her long time lady-mate and—ironically—their mini-dachshunds. Think about it for a second. Right...You got it: lesbians with wiener dogs. You can't make this stuff up. With that, butter beans, we're off to the market and other errands require to prepare the house for the undoubtedly cacophonous arrival this evening of our dear Sister Woman, Brother In Law Man and their pair of sassy, hair-obsessed pre-teen off-spring. i am in LOVE with that stunning double staircase, and walk-in closet! There's nothing exciting here, but after that dose of Trump's place yesterday, even a mock-med looks good. I kind of like the simplicity and lack of faux-fussy. Oh Mama ––– siblings and their sprogs? Good luck with that. Such a sad little house, which has nothing whatsoever to do with Staging Lady in a Pink Toyota's choices; it's hardly sporting to mock this Mock Med. It beggars belief that the previous owner bought it for $235K and flipped it to Paula less than a year later for a million more. Double staircases are stupid and this is one of the worst and cheapest ones I have ever seen. The closet is large but like the rest of the home, also cheaply done. Awful. I am surprised what a modest house she lives/lived in. She made multiple millions in the past 20 years. I would have expected something much more grand. don't like the double staircase. those kitchen cabinets should be outlawed, or at least burnt. ugh. truly vomit-inducing, including the california closet. Just gross. MockMedMcMansions make me wanna puke, especially when owned by people with enough money to buy SOME taste. Just ugh. Shopgirl read my mind. After that long a career she is either modest or she has blown through (no pun intended) a fortune. If thats the case its sad. 1:16 My, my. I would love to see the place you call home. I would be willing to bet this house is a palace beside yours. No, definitely this house isn't a $5M and up kind of place like many we see on this blog, but it's certainly a nice home and would do just fine for "most" people including 1:16. I think this is the home Paula was living in when she had the stalker. I remember reading how she didn't really feel safe there anymore, so I bet that's why she is selling it. Also, let's all remember people can have money and still chose not to spend millions and millions on a very large home. They don't need it or want it. 10:56... The stalker was years ago. She probably WISHES she had a stalker now. If what you said had any truth, she would have left then. And had she, she would have pocketed much more money, for a dismal property. 11:29. This is the house she lived in, but the stalker killed herself in front of the house. Also, I doubt seriously anybody wants a stalker. Ridicious statement. If you think this house is dismal, you really need to get out more and see the real world. wow, not even as a house for mere mortals could this plalce impress. UGLY UGLY UGLY. And two staircases side by side, what was the builder, surely not architect, thinking ?